Sorry for the delayed roundup, but a combination of wanting to be respectful to our friends in Florida and those remembering 9/11, it just felt like a good day to pay respects elsewhere. But this was a special event for all involved to cap off the USGA's biggest amateur event season--with MidAm's still to go--and I would be remiss in not celebrating another spectacular Walker Cup. The event reaffirmed its place as one of the best to watch and attend. David Shefter's game story for WalkerCup.org on the matches. Sunday Foursomes video highlights. And Sunday's Singles highlights. Sunday photos from the matches by Chris Keane and J.D. Cuban captured the beauty of both the matches and venue. Brentley Romine at Golfweek on redemption for Captain Spider Miller and Maverick McNealy after the 2015 landslide loss at Lytham. Golf World's John Strege on Stewart Hagestad securing a Sunday singles point to cap off an incredible year for the mid-amateur. John Hopkins assesses the matches and where things went turned so suddenly for a GB&I that played better than the final match score suggested. Alistair Tait talks to the GB&I side for Golfweek and they blamed their play on the type of golf played, however it's fascinating to see how much they assumed the course had to be played with only an aerial attack. Cart drivers take note: Captain Miller had his foursomes players not "caucusing" too much, meaning they played proper foursomes with the player due to hit the next shot moving down play. This, and other match notes from Global Golf Post. Alex Miceli at MorningRead.com explores the two sides explorations into adding a third day. Alistair Tait at Golfweek is opposed. Put me down for kicking off with a first day four-ball session, followed by the weekend days remaining the same. Colin Morikawa, Doug Ghim and Maverick McNealy all went 4-0, the first time three players on one team have done so. Jim Nugent talked to Curtis Strange, Brad Faxon and Buddy Marucci about their fond Walker Cup memories, and make sure to check out those team turtlenecks from ’83. John Strege talks to the USGA's Mike Davis about using the Walker Cup to learn about the setting up LACC North for the 2023 U.S. Open. Ben Crenshaw talked to AmateurGolf.com about the matches and LACC. My take from Saturday night on the 78-yard 15th, which gave everyone a thrill and exceeded expectations as set out in last week's Eye On Design looking at this hole. Finally, loved these casual team shoes by Canoos and modeled by Captain Spider. You can buy 'em here. 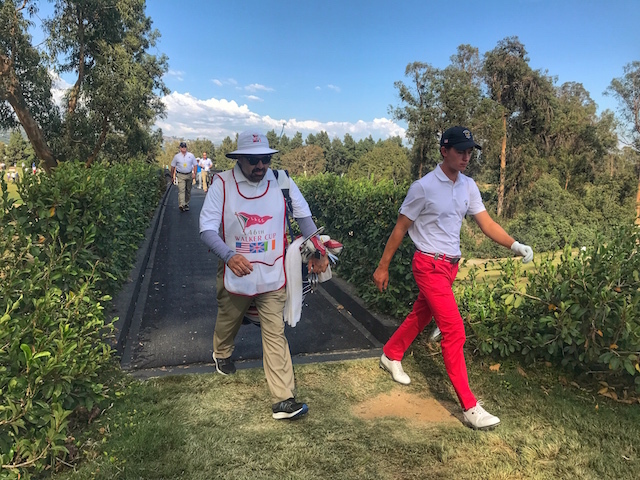 My Golfweek column from the Walker Cup focused on the role of club caddies last week, a tradition that has become one of the more charming aspects of this team competition. ...has arrived and well, I'm going out to watch. So while we have our friends in Florida in mind, please forgive the coverage from day two at The Walker Cup. The USA team has taken a strong 8-4 lead after a late surge in singles, writes Brentley Romine. GB&I is in trouble after falling four points down, writes Alistair Tait. LACC's 15th hole played 78 yards Saturday. I report for Golfweek. The players have refined the art of the practice round, the course looks superb and Los Angeles Country Club is ready for its unveiling. The U.S. needs to get off to a strong start in foursomes, not always their strong suit, writes Brentley Romine for Golfweek. The first day session pairings were announced at the flag-raising ceremony, here they are. Ali Stafford has a fun look back at what became of the 2001 Walker Cup teams. Photos from a beautiful Friday practice session and evening in Los Angeles. Mike Trostel of the USGA interviewed Gil Hanse and myself about the golf course design and restoration. You can follow scoring here. WalkerCup.org will feature additional coverage in addition to Fox Sports 1's six hours each day. FS1 is on from 9-12 pm PT Saturday morning and 2-5 pm PT for their afternoon coverage. One of my favorite short threes on the planet gets a chance to shine. It could play as short as 85 yards and long as 140 in the 2017 Walker Cup. As I explain in this Eye On Design, the hole was a 1927-28 creation when LACC was remodeled and may have have briefly featured sand in the middle, but if it was there, the bunker was short-lived and replaced by a large pimple. Alistair Tait of Golfweek talks to a GB&I squad that is bullish on their chances even though the bookmakers disagree. “The best thing about our team is that we’ve grown up together,” said Florida State’s Harry Ellis, the reigning British Amateur champion. “I’ve been with Alfie (Plant) for five or six years. Jack (Singh Brar), Scott (Gregory) and I live 10 miles apart so we’ve grown up together. Actually, this whole group has all come through junior golf together. Teammates face off! Wake Forest's current men's golf team features a member of both squads and two graduated Stanford players also could face off representing their countries. David Shefter with all of the fun details. Jeff Hall tells Mike Trostel what it means to have Los Angeles Country Club as a host, with some fun drone footage by Fred Vuich accompanying. USA Captain Spider Miller wants to see the competition expanded to three days, with a four-ball component added, writes Jim Nugent of Global Golf Post. Michael Bamberger loves the Walker Cup venue list and explains why LACC fits with the prestigious venues that have previously hosted. Brentley Romine of Golfweek talks to players about their time with President George Bush, who lunched with the team and tended the flag for them in a four hole-exhibition Thursday. Here are the USGA's video highlights from the day with 43. Images from the practice round by Harry How and Chris Keane capture plenty of great moments and the special setting. It won't be used in the Walker Cup matches but you'll see if sitting next to the big 17th hole. We restored this little beauty of a greensite that caused George Thomas headaches after a course setup gone awry in the 1925 California State Open. And yes, I dared to claim for this week's Golfweek digital edition that the North may be the second best match play venue on the planet after the Old Course. John Strege of Golf World on LACC letting its guard down to host a major golf event. John Mummert of the USGA's image gallery of the course is really nice viewing. Justin Thomas on his fond memories of playing the Walker Cup. USA Captain Spider Miller with thoughts on each of his players. The Team USA official page and bios. Team GB&I bios are here. Rory McIlroy makes a pretty powerful statement about the importance of making Walker Cup. Robert MacIntyre of Scotland is profiled by Martin Dempster for The Scotsman. Dempster also profiles the first "Fifer" to make the GB&I squad since 1985, Connor Syme. AmateurGolf.com's Walker Cup page of TV Times and other pertinent information. Here is the course yardage breakdown, though it'll almost be guaranteed not to play this long. The USGA's Jeff Hall has some exciting plans for taking advantage of what I believe to be the best match play golf course outside of St. Andrews. The 2017 Walker Cup is here and Los Angeles is sensing the buzz! The motorcades have stifled traffic and the paparazzi have staked out the team hotel and...ok that's a stretch. But as we discussed on Morning Drive today, this is one we Angelenos have been anticipating for some time. 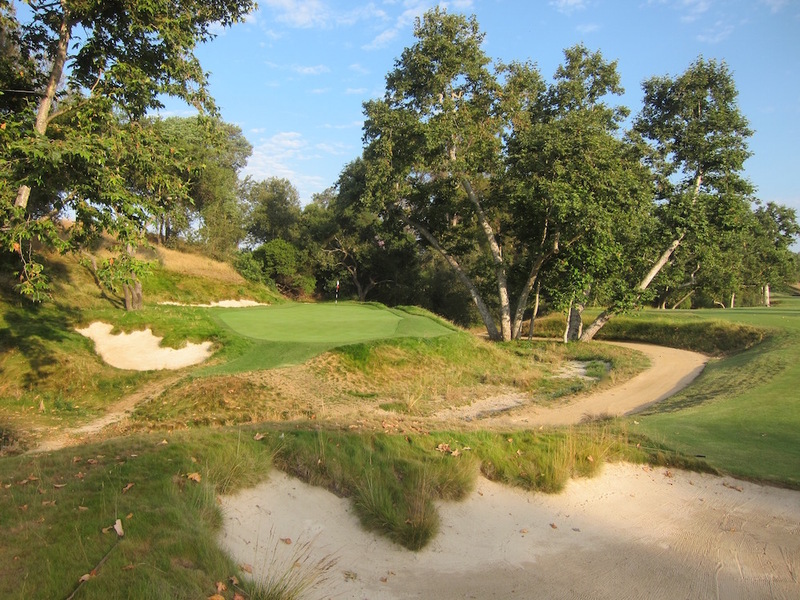 Full and only disclosure here for the week: I worked on the restoration of LACC's North Course since 2007 with Gil Hanse, Jim Wagner and many fine shapers, contractors, club officials and fine committees. The Walker Cup will be a celebration of all that went into restoring George Thomas and Billy Bell's 1927-28 redesign. More details on that later in the week, but if you must jump ahead, Ran Morrissett's 2014 review should tell you plenty about the architecture. In the video I explain the format and general superiority of this event over just about all others in golf based on the experiences had by all at the 2013 Walker Cup. You'll see many of my images from that event in the Eye On Design embedded below. A great shame for GB&I Captain Craig Watson after nearly two years of preparation. He will be replaced at next week's Los Angeles Country Club matches by Andrew Ingram. 30 August 2017, St Andrews, Scotland: The Great Britain and Ireland Walker Cup Captain Craig Watson is standing down from next week’s match at Los Angeles Country Club in the USA due to a serious illness in his immediate family. In his absence Andrew Ingram, Chairman of the GB&I men’s selectors, will take over as Acting Captain. Ingram, 57, represented Wales at junior and youth level before going on to captain the Welsh men’s Home Internationals team on five occasions, including their victory in 2002. He became Chairman of the R&A Men’s Selection Committee in 2014 and has been Chairman of the Teams and Performance Committee at the Golf Union of Wales for more than ten years. Ingram captained the winning European Junior Ryder Cup Team in the USA in 2004 and also at Celtic Manor in 2006 where Europe retained the trophy. He currently plays to a handicap of two and is a member at Royal Porthcawl. USGA's "Walker Cup Needs New Selection Process"
Some people sample fine wines, GolfChannel.com's Ryan Lavner tracks the always-flawed Walker Cup team selection process. And while you might not care about the plight of college golfers snubbed because they don't fit the team room dynamic, or mid-ams because they didn't play well enough, the entire mess is important if you'd like to see amateur golf survive. The latest top talent to be passed over by the committee working in secret, LSU's Sam Burns, is the Nicklaus Award winner and sports a resume as strong as the last LSU player passed over for suspicious reasons, John Peterson. By almost any metric, Burns should have been a lock for the U.S. team. Three months ago, the LSU sophomore earned the Nicklaus Award, given to the top college player. Drawing significant interest from sponsors and tournament directors, he could have turned pro in June but opted instead to wait until after the Walker Cup in September. It should not have been a risk, but that decision proved costly: Last month he played the Barbasol Championship, an opposite-field event on the PGA Tour, and tied for sixth. Because he was an amateur, however, he forfeited a $113,000 payday and sacrificed other playing opportunities. Burns was the Division I player of the year. He remained amateur through the summer. He starred in a Tour event. It’s unclear what else he could have done to show the committee how much making the team meant to him, save for getting an American flag tattoo. Another sad day for Mid Ams. The message @USGA has sent to Mid Ams this year isn't very positive. Besides the biennial oversight issue, the lack of a running points list and sense of momentum leading to the team selection hurts the marketability of the event. For better or worse, team cup points lists keep us aware of who is in the running. The Walker Cup, however, is selected in private and therefore, is conducted in private. It remains one of the stranger things in golf: a committee working off of no public points system selects the biennial Walker Cup team. Unfortunately it leaves them open to criticism when players widely viewed as top talent get passed up. LSU's Sam Burns, assumed to be a lock, was the most notable left off the team and who postponed turning pro with the Walker Cup in mind. Brentley Romine at Golfweek's assessment of the notables and his capsules of the team. Among the notables left off: Sam Burns and Sean Crocker, who will now both turn pro immediately; and mid-amateur Scott Harvey, who played in the 2015 Walker Cup. The USGA’s International Team Selection committee does not make its points list public, and no USGA official was made available for comment Sunday to discuss how the roster was constructed. PACIFIC PALISADES, Calif. (Aug. 20, 2017) – The United States Golf Association today announced the 10 players who will make up the 2017 United States Walker Cup Team. The USA team will meet Great Britain and Ireland in the 46th Match at The Los Angeles (Calif.) Country Club’s North Course, Saturday and Sunday, Sept. 9-10. The 10 players chosen by the USGA’s International Team Selection Committee and captained by John “Spider” Miller, of Indianapolis, Ind., are: Cameron Champ, 21, of Sacramento, Calif.; Doug Ghim, 21, of Arlington Heights, Ill.; Stewart Hagestad, 26, of Newport Beach, Calif.; Maverick McNealy, 21, of Portola Valley, Calif.; Collin Morikawa, 20, of La Canada Flintridge, Calif.; Doc Redman, 19, of Raleigh, N.C.; Scottie Scheffler, 21, of Dallas, Texas; Braden Thornberry, 20, of Olive Branch, Miss. ; Norman Xiong, 18, of Canyon Lake, Calif.; and Will Zalatoris, 21, of Plano, Texas. McNealy is the lone returning player from the 2015 USA Team. The Walker Cup Match is a biennial amateur team competition between the USA and a team composed of players from Great Britain and Ireland, selected by The R&A. The Match is played over two days with 18 singles matches and eight foursomes (alternate-shot) matches. The USA leads the overall series, 35-9-1, but the teams have split the last 14 meetings since 1989. The first USA Walker Cup Team, which posted an 8-4 victory in 1922 at the National Golf Links of America, in Southampton, N.Y., is considered among the best teams ever assembled and included Francis Ouimet, Bob Jones, Charles “Chick” Evans and Jess Sweetser. Many of the game’s greatest players have competed in the Walker Cup, including U.S. Open champions Jack Nicklaus, Tiger Woods, Jordan Spieth and Dustin Johnson for the USA and Graeme McDowell, Rory McIlroy and Justin Rose for Great Britain and Ireland. The Walker Cup Match will be conducted for the third time on the West Coast and was previously hosted by Seattle (Wash.) Golf Club in 1961 and Cypress Point Club, in Pebble Beach, Calif., in 1981. This year’s match will be played on The Los Angeles County Club’s North Course, which was designed by George C. Thomas Jr. and restored by Gil Hanse. The course will be set up at 7,425 yards and play to a par of 35-36-71. Sam Burns, 21, of Shreveport, La. ; Dawson Armstrong, 21, of Brentwood, Tenn.; and Dylan Meyer, 22, of Evansville, Ind., are the first, second and third alternatives, respectively. Cameron Champ, 22, of Sacramento, Calif. (born 6-15-95): He was one of two amateurs to make the 36-hole cut in the 2017 U.S. Open, tying for 32nd. Champ won this year’s Trans-Mississippi Amateur by four strokes and was runner-up in the Pacific Coast Amateur. Champ, who was the medalist in the North & South Amateur in June and a semifinalist in the Western Amateur in August, was chosen third-team All-American and first-team All-Southeastern Conference. He helped Texas A&M University finish second in the 2017 SEC Championship. Champ, a product of The First Tee program, tied for fifth individually at SECs. His father, Jeff, was selected in the 1988 Major League Baseball Draft as a catcher by the Baltimore Orioles. Doug Ghim, 21, of Arlington Heights, Ill. (born 4-16-96): He advanced to the 36-hole championship match of the 2017 U.S. Amateur, where he was defeated by Doc Redman in 37 holes. Ghim was chosen first-team All-American and Big 12 Conference Player of the Year as a junior at the University of Texas. He helped the Longhorns win the Big 12 Championship and tied for second individually. Ghim was also the runner-up in the NCAA Austin Regional. In 2017, he won the Pacific Coast Amateur by one stroke at Chambers Bay with a 72-hole score of 9-under 275 and was fourth in the Northeast Amateur. Ghim was the 2014 U.S. Amateur Public Links runner-up to Byron Meth and a semifinalist in the 2013 U.S. Junior Amateur. He has played in seven USGA championships, including four U.S. Amateurs. Stewart Hagestad, 26, of Newport Beach, Calif. (born 4-10-91): He won the 2016 U.S. Mid-Amateur Championship by defeating Scott Harvey in 37 holes. Hagestad, who became the second-youngest champion, produced the largest comeback victory (4 down with 5 holes to play) since a 36-hole Mid-Amateur final was introduced in 2001. He was the low amateur in the 2017 Masters Tournament, tying for 36th, and competed in this year’s U.S. Open. Hagestad was a member of the University of Southern California (USC) golf team and graduated in 2013. Hagestad, who was chosen 2016 Metropolitan Golf Association Player of the Year, won last year’s Met Amateur, edging Ethan Ng in 38 holes. He has played in 12 USGA championships, including eight U.S. Amateurs. Maverick McNealy, 21, of Portola Valley, Calif. (born 11-7-95): He earned the Mark H. McCormack Medal as the world’s top-ranked amateur in 2016. McNealy was a member of the 2015 USA Walker Cup Team and halved his Sunday singles match with Paul Dunne. He was a first-team All-American and first-team All-Pac-12 Conference selection for the third consecutive season as a senior at Stanford University. McNealy was the recipient of the Ben Hogan Award as the nation’s top collegiate player, and received the Byron Nelson Award and Pac-12 Scholar-Athlete of the Year. He competed in this year’s U.S. Open at Erin Hills and The Open Championship at Royal Birkdale. McNealy tied for 44th in the PGA Tour’s John Deere Classic. He has competed in his nine USGA championships and four U.S. Amateurs. McNealy, who advanced to this year’s U.S. Amateur match-play bracket, was a member of the USA team that tied for sixth in the 2016 World Amateur Team Championship. Collin Morikawa, 20, of La Cañada Flintridge, Calif. (born 2-6-97): He advanced to the Round of 16 for the second consecutive year in the U.S. Amateur Championship. Morikawa defeated a pair of Australians in the first two rounds of match play. He earned first-team All-American and first-team Pac-12 Conference honors as a sophomore at the University of California. He was chosen 2016 Pac-12 Conference Freshman of the Year. Morikawa, who competed in his first USGA championship at the 2015 U.S. Amateur, won the 2017 Northeast Amateur by two strokes with a 72-hole score of 11-under 265. He was the Sunnehanna Amateur runner-up, losing to Braden Thornberry in a three-hole playoff, and tied for second in the Trans-Mississippi Amateur. Doc Redman, 19, of Raleigh, N.C. (born 12-27-97): He is the 2017 U.S. Amateur champion, edging Doug Ghim in 37 holes in the championship match. The runner-up in the 2017 Western Amateur, he advanced to the championship match of the U.S. Amateur after making the match-play field through the playoff with a par on the par-4 10th hole at The Riviera C.C. At No. 62, he is the second-lowest seed to make the final match (Steve Fox was No. 63 when he won in 2012). He was a first-team Freshman All-American and the 2016-17 ACC Freshman of the Year at Clemson University, where he will begin his sophomore year. He also finished sixth in the Northeast Amateur in 2017. Redman, who caddies at home during his free time in the summer, reached match play in the 2016 U.S. Amateur. He also earned All-Atlantic Coast Conference honors as well as Academic All-ACC honors in his freshman year, when he led Clemson in stroke average. He was a Rolex honorable mention All-American in high school, when he won the 2016 North Carolina 4A Championship. Scottie Scheffler, 21, of Dallas, Texas (born 6-21-96): The low amateur in the 2017 U.S. Open at Erin Hills, he was a first-team All-American in his junior year at the University of Texas. At Erin Hills, he shot 69-74-71-73 for a 1-under-par total of 287 and a T27 finish. An all Big-12 Conference selection, he finished T3 individually (6-under 282) at the 2017 NCAA Division I Men’s Golf Championships and was also on the Ping All-Region team. He won the U.S. Junior Amateur Championship in 2013. A member of the USA Team at the 2016 World Amateur Team Championship in Mexico, Scheffler also qualified for the U.S. Open in 2016. In 2015, he was the Phil Mickelson Freshman of the Year and the Big 12 Newcomer of the Year. Braden Thornberry, 20, of Olive Branch, Miss. (born 4-11-97): He won the 2017 NCAA Division I individual title by four strokes with a 72-hole score of 11-under 277. Thornberry earned the Fred Haskins Award as the top collegiate golfer. He earned first-team All-America and first-team All-Southeastern Conference recognition as a sophomore at the University of Mississippi. He tied for third in the SEC Championship and finished fourth at the NCAA Austin Regional. In 2017, Thornberry won the Sunnehanna Amateur in a three-hole playoff with Collin Morikawa and tied for fourth in the PGA Tour’s FedEx St. Jude Classic, the best finish by an amateur in the tournament since 1965. He has played in four USGA championships, including three U.S. Amateurs. He reached the Round of 32 this year and defeated Joaquin Niemann, the world’s top-ranked amateur, in the first round. Norman Xiong, 18, of Canyon Lake, Calif. (born 11-9-98): He earned the 2017 Phil Mickelson Award as Division I’s top freshman while playing at the University of Oregon. The Ducks won the Pac-12 Conference Championship, finish third at the NCAA Baton Rouge Regional and reached the NCAA match-play final against Oklahoma. Xiong was the Pac-12 Freshman of the Year and a first-team all-conference selection. He shot rounds of 64 and 70 in stroke play to earn the No. 2 seed in the 2017 U.S. Amateur match-play bracket. Xiong defeated Doc Redman in 22 holes to win the 2017 Western Amateur and was the championship’s stroke-play medalist by one stroke over Brad Dalke. Xiong won the 2015 CIF/SCGA Regional as a sophomore at Temescal Canyon High School. Will Zalatoris, 21, of Plano, Texas (born 8-16-96): He reached the Round of 16 in the U.S. Amateur for the second time in his career. Zalatoris, who won the 2014 U.S. Junior Amateur, defeated the 2015 Junior Amateur champion Philip Barbaree, 1 up, in the first round. Zalatoris earned first-team All-America honors and was the Atlantic Coast Conference Player of the Year as a junior at Wake Forest University. He posted a pair of top-5 finishes in the ACC and NCAA Austin Regional tournaments. Zalatoris, who has played in 10 USGA championships, has competed in five consecutive U.S. Amateurs, including four straight in which he has advanced to match play. He finished third in this year’s Pacific Coast Amateur and tied for 10th in the Trans-Mississippi Amateur. In 2016, he won the Trans-Mississippi Amateur and Pacific Coast Amateur titles. While there was a backlash from some over-25-year-olds, the USGA's abandonment of two automatic mid-amateur Walker Cup team slots will actually turn out to be a positive for the mid-am world. Bear with me geezers before you angrily comment. Jim Nugent revealed in Global Golf Post that the automatic two-spots--another lousy idea from the lousy Tom O'Toole USGA days--will be abandoned. There is some irony in yet another impeccably-timed USGA move (given that 26-year-old Stewart Hagestad was low amateur at the Masters and may be America's top amateur right now). Given the depleted college ranks this year, the 2017 team has a chance to see at least two mid-ams without the requirement. Or maybe more. While I get that reaction, ultimately the requirement suggested that mid-ams needed help making the team. But without that crutch the mid-amateurs who make the team will actually receive even more respect. They will stand out less as recipients of a special exemption, and fit in more naturally as U.S. Walker Cup team members. WSJ: "Low Amateur at the Masters Lines Up His Next Shot: Business School"
While these stories could come off to the unsuspecting as extreme first world tales, having seen Stewart Hagestad up close last week and watching him handle his Masters "wild ride" with aplomb, his is another great 2017 Masters memory. Brian Costa and Rebecca Davis O’Brien file for the Wall Street Journal on Hagestad's time in New York and the unusual golf life he lived in the city. During the day, Hagestad helped put valuations on commercial properties. Most weeknights, Hagestad would head to Golf & Body NYC, a specialized golf gym in an office building off Herald Square. The gym, which has just under 200 members, charges a $10,000 initiation fee and $7,500 in annual dues. He spent hours there, trainers at the club said—a routine in the weight room, putting on a turf green, practicing drives in a simulator—sometimes closing the club on weeknights at 10pm. One Saturday morning, Bradley Borne, the club’s director of sports medicine, arrived to find Stewart sitting behind the golf desk, “like he worked there,” Borne said. Tim Rosaforte for Golf World on Hagestad's week that started with nerves, bad signs for his game and ended with a made cut, not to mention the joy of seeing Jimmy Dunne on the range. Hagestad had interviewed with Dunne for a job (unsuccessfully). From the most nervous he’d ever been in that practice round with Spieth and Kuchar, to fairly relaxed as a Masters rookie, Hagestad made the cut and turned the competition for low amateur with U.S. Amateur champion Curtis Luck into a story line. After making the turn on Sunday, Hagestad’s caddie asked if he wanted to know what Luck posted. Hagestad talked to Shane Bacon on The Clubhouse podcast this week and back in December, appeared on Andy Johnson's Fried Egg podcast. He also was begged to turn pro on CNBC this week by Shark Tank's Kevin O'Leery, notes GolfDigest.com's Alex Myers. The Fox Sports/USGA press release provides fantastic news for fans who love team events and the first chance for a national audience to see Los Angeles Country Club's North Course, home to the 2023 U.S. Open. Twelve hours of coverage was announced for the September event. With 54 hours devoted to amateur golf that's down from the 76 hours annually that was pledged when the USGA and Fox announced their partnership in 2013. Latest Walker Cup Selection Idea Could Be Problematic For U.S. Despite a rough showing from the U.S.A. team in 2015, the USGA mercifully stuck to its plan of Walker Cup Captains overseeing a home and away game by naming Spider Miller the 2017 Captain at Los Angeles Country Club. Miller was quite emotional after the matches at Lytham and criticized for some of his decisions, though it's a behind-closed-doors USGA committee that selects the team. And Ralph Lauren those red pants. FAR HILLS, N.J. (Nov. 17, 2015) – The United States Golf Association (USGA) today named John “Spider” Miller, of Bloomington, Ind., as the captain of the USA Team for the 2017 Walker Cup Match at Los Angeles (Calif.) Country Club. Miller, 64, captained the USA Team in the 2015 Match at Royal Lytham & St. Annes Golf Club in Lancashire, England. He won the U.S. Mid-Amateur Championship in 1996 and 1998 and represented the United States in the 1999 Walker Cup Match. The Walker Cup Match, which began in 1922, is a 10-man amateur team competition between the USA and a team comprised of players from Great Britain and Ireland. Great Britain and Ireland won the 2015 Match, 16½-9½. The USA leads the competition, 35-9-1. In his U.S. Mid-Amateur victories, Miller defeated Randy Lewis, 3 and 2, in 1996 at Hartford Golf Club, in West Hartford, Conn.; and in, 1998, he became the oldest U.S. Mid-Amateur champion at the time, at age 48, when he scored a 1-up victory over Chip Holcombe in the final at NCR Country Club’s South Course, in Kettering, Ohio. As a result of those wins, he competed in the Masters Tournament in 1997 and 1999. In the 1999 Walker Cup Match played at Nairn Golf Club in Scotland, Miller teamed with Hunter Haas to win a pair of foursomes matches before he lost to Paul Casey, 3 and 2, in singles. In 1997, he led Indiana to a tie for third in the USGA Men’s State Team Championship by carding a 54-hole score of 4-under-par 209. Miller was inducted into the Indiana Golf Association (IGA) Hall of Fame in 2000. He twice was chosen IGA Player of the Year and is a two-time IGA Mid-Amateur champion. He and partner Jerry Nelson claimed five IGA Four-Ball championships, and he was the low amateur in the Indiana State Open three times. A 1973 graduate of Indiana University, Miller owns Best Beers, Inc., based in his hometown of Bloomington. He and his wife, Kathy, have five children. What Does The U.S. Want To Be In The Walker Cup? Here's the good news: rock bottom for the Walker Cup and Team USA has been hit! And almost no one saw the carnage! Buried over on ESPN3 was the BBC coverage for American viewers (where Peter Alliss and friends entertained) on the first Sunday of NFL action. So for the five people who could get the WatchESPN app to work, it was a blowout for the ages. That's because Team USA went to Royal Lytham & St. Anne's and lost in record fashion and also for the fifth time in six visits to the links of the UK. And continuing the trend of other American teams, they predictably stunk up the foursomes play. Oh, and they lost to a Great Britain & Ireland team that rose to the occasion. Alex Miceli at Golfweek.com reports that "the result was almost a fait accompli before the 10 singles matches commenced on Sunday afternoon with GB&I holding a commanding 10-6 lead." That's fair to say. So congrats to the UK's best young amateurs. Team USA was undone in large part by 21-year-old Jimmy Mullen, who Alistair Tait at Golfweek.com reports joins "Paul Casey and Luke Donald (1999) and Andrew Oldcorn (1983) as the only players to record four wins out of four in Walker Cup history." The R&A's official site reports on the 16½-9½ win at the 45th Walker Cup and includes this highlight video. Now, the bad news for Team USA. After a thrilling win in 2013 at the National Golf Links, the big win by GB&I leaves the American team and the ultra-secretive USGA-designed selection process in shambles. After all, as Ryan Lavner noted, the USA only leads 6-5 in the series since 1995 despite having about a 250,000,000 million popularion advantage. Just think, Florida freshman Horsfield passed on the cup for personal reasons and debuted at the Carpet Capital Collegiate with a T4. (Kevin Casey reports.) Had Horsfield played, GB&I might have won by more. It never hurts to face Team USA mid-ams who went 1-5 and have gone 3-8 since the USGA mandated their team include two players over the age of 25. While the news was bad at Lytham, there is this: the Walker Cup is an exhibition and Team USA appeared to represent their country well. That's all that ultimately matters to most Americans, but not all. Plus, it's not Team USA's fault that the USGA has a super-secretive selection process creating bad karma with the mandatory two mid-am picks. And it's not the fault of players that the USGA is beholden to a corporate arrangement with Ralph Lauren that has the players wearing four uniforms in two days of competition, making them look like fools in a blowout loss by auditioning Ralph's latest and greatest at an amateur golf competition. Either that, or the USGA has decided to spend their Fox money on uniforms and Ralph is just going along with the excess. Regardless, the emphasis on style over substance did not go unnoticed. Given what we've seen of the current USGA mindset of valuing loyalty and perceived tradition over the most basic common sense, changes to the team selection process will be unlikely. They should be striving to improve Team USA's chances when the matches are next played September 9 and 10, 2017 at The Los Angeles Country Club, but that would require Chairwoman Diana Murphy and friends to take a hard look at their own committee's decisions prior to this Cup. Does any of this matter? Only in a first world sense. In the world of modern sports, the Walker Cup is about to get more important because it's about to be televised, and we know you aren't happening in this world unless you are on TV. With Fox televising in 2017 and Golf Channel moving in with the 2019 matches, this historic amateur competition is about to see a new spotlight. Which is why it's time for the USGA to end its secret selection process that fueled rumors of old boys network activities (fueling this year's mid-am selections even though they were the last two U.S. Mid-Amateur Champions). The lousy karma and bad blood from people who should be the USGA's biggest supporters over the mandatory mid-am selections is quietly undermining America's effort. Most of all, the need to publish a Walker Cup points list detailing who is earning their way on to the team is vital for two reasons. There's the USGA's credibility that is on the line, if they even care. Letting players earn their way on without having to pass some imaginary character test from an anonymous committee of people who have never played the game at a high level, is essential. And a points list makes common marketing sense heading into the 2017 matches. You know, making people aware that one of golf's most historic and thrilling competitions is actually taking place. Besides, if you don't do anything, there will be calls for a task force. Don't tempt us!